Megan Brown is giving our community’s most desperate people a chance in life: Fetal Alcohol Spectrum Disorder (FASD) children are in her heart. When volunteers were thin on the ground, Robert “Clarkey” Clarke coached up to five footy sides. The Finke Street Party and Night Market made social life spark (photo: Gun competitor Toby Prize giving autographs). Jordann Hickey excelled in a string of sports. Sydney “Syd” Kinsman (pictured below) is looking back on 70 years of volunteering and being a hero in WWII. These are the people and activities, receiving awards, which gave a special meaning to Australia Day in The Alice today. He has volunteered services to the Rovers Football Club for more than 14 years, not only as president, but as coach, assistant coach, team manager, administrator, water boy, taxi and more. During seasons where the club experienced shortages of volunteers, Robert managed coaching up to five teams (in one season) whilst maintaining all other commitments, including running his own business. He is also a driving force behind the financial stability and community recognition that the club enjoys today. Rather than simply succumbing to a passion for football, Robert is motivated by an understanding of sport, particularly Australian Rules football, as an instrument for positive change in the lives of young people in our community. In 2018, the peak body for Australian Rules Football in the Northern Territory, AFL Central Australia, recognised Robert’s dedication by honouring him with lifetime membership. Megan Brown is one of a number of foster carers, paediatricians and doctors opening doors into Foetal Alcohol Spectrum Disorder (FASD) awareness within Central Australia. As a carer for Territory Families, Megan has cared for more than 30 special needs children during her past 18 years in Alice Springs, and is currently looking after a young person with FASD, unable to be reunited with family. Last September 2018, Megan hosted the International FASD Awareness Day picnic at the Alice Springs Telegraph Station. She also created the FASD Q&A Support Group Alice Springs Facebook page – currently with over 100 local and international members – to offer non-judgmental support to parents, carers, educators, professionals and young people living with FASD. Through this private group, Megan organises face to face support meetings six times per year where she and others share personal experiences, and listen to guest speakers discuss new information on FASD. After arriving in 1948 as a 27 year old, Syd Kinsman (pictured above) has devoted more than 70 years to the local community of Alice Springs. 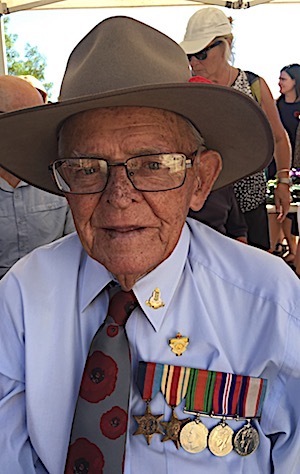 He has worked as a builder and renovator, volunteer fire fighter, master creator of May Day Parade floats, life member of the Alice Springs Show Society, is a member of the RSL, and contributor to Legacy and The Salvation Army, organisations that provided assistance to Syd and his family upon his return from service . Prior to his arrival in Alice, Sydney was a volunteer serviceman, landing in Palestine in 1940 as a 19 year old member of the 2nd/48 th Battalion – Australia’s highest decorated unit of World War II – and became one of legendary “Rats of Tobruk”. Every Anzac Day, Syd attends the Anzac Hill service to remember those he fought alongside. Syd ’s advocacy for Alice Springs becomes most conspicuous on December 1 each year when the front lawn of his home on Larapinta Drive becomes a dazzling Christmas lights display, enjoyed by thousands of residents, visitors and passers-by. In October 2018, Jordann Hickey became the first Central Australian to be selected in the AFL Women’s draft to play for the Melbourne Football Club. Jordann ended her 2018 VFL Women’s season with the NT Thunder on 14 goals from 14 games, was honoured by her club as Rookie of the Year, and finished fourth in the Club Champion Awards. After netball and swimming, Jordann began playing football for Alkamilya Women’s Football Club as a 19 year old, switching to the Rovers in the CAFL 2017 season, and went on to play for the Darwin Buffettes in the TIO NTFL, making it to a Grand Final in the 2017/18 season. Jordann’s rising star is a testament to her commitment and perseverance in achieving personal goals, and her influence is opening pathways for other young Central Australian women inspired to follow her example. The Finke Desert Race Club’s decision to combine their low-key prelude events into the single Finke Street Party & Night Markets event, held in the Alice Springs CBD, enabled broader attendance by local residents, competitors and visitors as well as increased media exposure leading up to the race. The Club’s estimates for the June 2018 evening report about 4,000 people attended, including 60% of competitors and 54% of spectators. More than 130 media items were posted and nearly 800,000 hits were received by Finke’s social media channels, with photos and videos of the event reaching around the world. Local businesses did an enormous trade and feedback on the night was overwhelmingly positive, with many new strategies under consideration for an even bigger event this coming year. 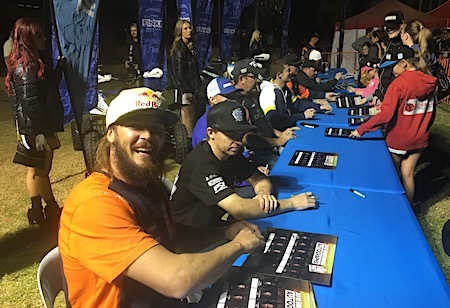 Finke Desert Race Club, a local community group run by volunteers with one part – time administration officer, estimates the event weekend injected over $7m into the local economy.